The first trailer for Netflix's Bird Box sets the eerie tone right off the bat. Sandra Bullock is seen in the woods, blindfolded, pleading to someone, or something not to take her children as an ominous bell rings. The new film is based off of the 2014 post-apocalyptic novel by author Josh Malerman. The book received critical praise upon its release four years ago, and has been compared to the works of Stephen King and Jonathon Carroll. Even in the brief trailer, one can spot some of King's influence. Bird Box takes place when a mysterious force decimates most of the world's population. People are faced with their worst fears and abruptly go mad when they come into contact with the force, leaving survivors to go into hiding to avoid seeing who, or what is causing the death and destruction. Facing the unknown, Sandra Bullock's Malorie finds love, hope, and a new beginning only for it to unravel. Later, she has to leave the safety net with her two children down a dangerous river to the one place left that is believed to offer sanctuary. In order to survive, they'll have to undertake the perilous two-day journey blindfolded. Josh Malerman's Bird Box novel features three parts of lead character Malorie's life: the beginning, after the pregnancy, and the present day. It appears that the Netflix adaptation will follow the same structure, though it is unclear if it will be told in a linear manner at this time. However, the trailer already proves that it is following the chilling atmosphere of the book, which looks like it's going to put viewers on the edge of their seats. Speaking of which, Netflix will also release Bird Box in select theaters upon its release later this year, which may be the best place to experience the film. The film rights to Bird Box were purchased back in 2013 by Universal Studios, before Josh Malerman's book had even come out. Andres Muschietti was attached to direct early on, but later dropped off of the project. Netflix acquired the streaming rights to the book in July 2017 and announced that Sandra Bullock would star in the movie. Principal photography started in October 2017, with the rest of the cast signing on shortly after. Bird Box is directed by Susanne Bier from a screenplay by Eric Heisserer. The project is produced by Dylan Clark, Chris Morgan, and Clayton Townsend. In addition to Sandra Bullock, the film also stars Trevante Rhodes, Jacki Weaver, Rosa Salazar, Danielle Macdonald, Lil Rel Howery, Tom Hollander, Colson Baker, BD Wong, with Sarah Paulson, and John Malkovich. 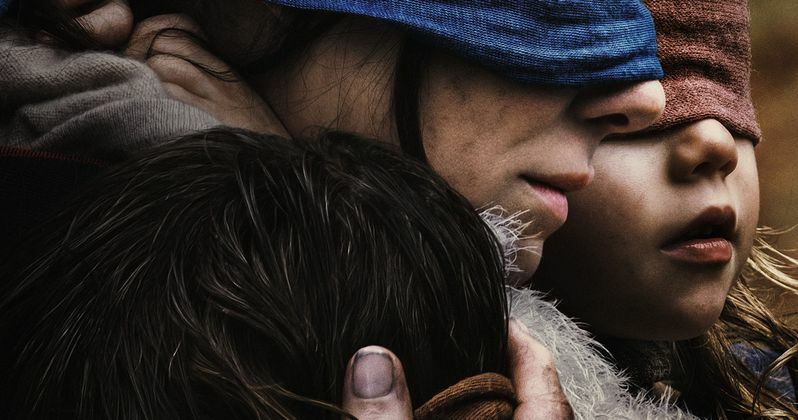 Bird Box will premiere on Netflix and open in select theaters on December 21st. While we wait for the premiere, you can check out the chilling first trailer below, thanks to the Netflix YouTube channel.